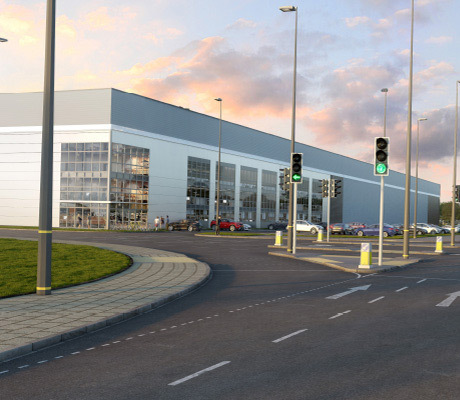 LGIM Real Assets (Legal & General) together with development partner Peel Logistics Property announces that they have secured planning permission for a 225,000 sq ft warehouse development at Phase II, Grand Central in Trafford Park. Owned by Legal & General's award winning Industrial Property Investment Fund (IPIF), Grand Central is a 8.2 acre logistics and industrial development located in the heart of Trafford Park, and the only site that can accommodate units up to 200,000 sq ft.
Tim Packer, Assistant Fund Manager to Legal & General's IPIF, comments: "With continued strong demand for larger distribution warehouses, this planning consent allows us immediate capacity to satisfy a scale of development not readily available elsewhere on Trafford Park. Given its location it is ideally suited for a conventional distributor or a last mile internet fulfilment operator. We will be in the market for a short period for build to suit development before making a decision on speculative development. We expect to begin construction from Q2 onwards to deliver a new facility during Q2 2019." Andrew Pexton, Director at GVA comments "The site is in a prime distribution location adjoining Phase 1, a 250,000 sq ft unit occupied by XPO Logistics. Once completed, the site's proximity to the Metrolink extension and stop at Parkway will offer flexible access for staff. The site has excellent access to the M60 and offers a unique opportunity for an end user to be located within 6 miles of Manchester city centre in a modern purpose built facility."